Coarse thread serrated hex flange lock nuts have a built in washer with serrations on the bearing or mating surface. The angled serrations help to prevent the nut from loosening and will resist vibrations. The large flange has the added advantage of covering up oversized and messy drill holes. 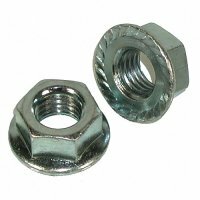 Serrated flange nuts actually require more torque to loosen the nut than is needed to tighten.